A PARALYSED and blind teenager who has the mental age of a three-month-old baby was told by Government officials to attend a ‘work-focused interview’ – even though she can’t speak. Danika Smith, 19, has spastic quadriplegic cerebral palsy, which has left her unable to walk and with the mental age of a zero to three-month-old, and she also has cortical blindness. After mother Donna, 41, put a benefits claim in for her several disabled daughter, the Department of Work and Pensions (DWP) sent a letter calling Danika in for a meeting. Ms Smith, who is her daughter’s full-time carer, planned to attend the meeting as she was “intrigued” to watch the adviser try and discuss work prospects with her. But after publishing the letter on Facebook, the DWP cancelled the meeting. The DWP is now largely being held to account not by opposition politicians, not by well-funded charities such as Disability Rights UK, but by activists with virtually no income. This is from the ‘Benefits and Work’ newsletter. What is particularly notable about these news items is that they were all brought about by tiny, private sector or unfunded groups or individuals. The ESA death statistics campaign is the work of Vox Political blogger Mike Sivier. The bogus sanction claimants were revealed by Welfare Weekly – a one-person online news aggregator. And the UN investigation has come about due to the tireless work of activist group Disabled People Against Cuts. Add to this the story of the 49 secret DWP investigations into claimant deaths, revealed earlier this year by John Pring’s Disability News Service, and a startling truth emerges. One of the main weapons of these new campaigners is the Freedom of Information Act. But we know that the government is already taking steps to try to dramatically curtail the use of the Act. How long before the government – or its multinational partners – also decide to take action against the campaigners themselves? Support for ever more harsh benefits cuts depends on people accepting that claimants are bad and the DWP is good. These campaigners are inconveniently proving that the opposite is true. GUIDELINES on how to deal with suicidal benefits claimants have been handed out by the Department for Work and Pensions to Scots workers tasked with rolling out the UK Government’s controversial welfare reforms. As part of a six-point plan for dealing with suicidal claimants who have been denied welfare payments, call-centre staff in Glasgow have been told to wave the guidance, printed on a laminated pink card, above their head. The guidance is meant to help staff dealing with unsuccessful applicants for Universal Credit who are threatening to self-harm or take their own life. A manager is then meant to rush over to listen in to the call and workers – who insist they have had no formal training in the procedure – must “make some assessment on the degree of risk” by asking a series of questions. 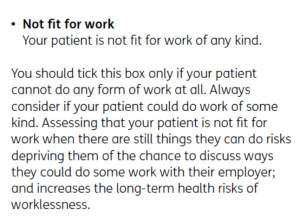 One section of the six-point plan, titled “gather information”, demands that staff allow claimants to talk about their intention to commit suicide. The call-centre workers, who earn between £15,000 and £17,000 a year, must “find out specifically what is planned, when it is planned for, and whether the customer has the means-to-hand”, according to the guidance seen by the Sunday Herald. Staff are also warned in the plan that they may have “thoughts and feelings” about the situation afterwards and offered reassurance that “this is all part of the process of coping with the experience and is normal”. Glasgow-based call-centre workers have accused the DWP of asking them to carry out the job of a psychologist or social worker. The SNP have accused the UK Government of “playing a dangerous game with people’s lives”. Universal Credit combines six working-age benefits – including housing benefit, Jobseeker’s Allowance (JSA) and tax credits – into a single payment. Although not yet fully rolled out across the UK, Universal Credit is already available to benefit claimants in more than 40 so-called “Jobcentre areas” in Scotland, including Glasgow, Edinburgh, Stirling, Inverness and Dumfries as well as parts of Lanarkshire, Aberdeenshire and Ayrshire. Processors and telephonists have to contact claimants to tell them they have been denied the new benefit or are facing sanctions which can mean payments are withheld for up to three years. One Scottish call handler, who asked not to be named, said: “Some of us have been given a baby-pink laminated sheet which we’ve been told to hold up in the air if someone threatens to self-harm or commit suicide. So, when we are on the phone speaking to claimants – who are often very vulnerable people who are being sanctioned all the time and have no money – if they express that they intend to harm themselves or kill themselves there is a sheet instructing us how to react, which involves asking a number of questions, including how they intend to do it. The Department for Work and Pensions has admitted making up comments from supposed “benefit claimants” that appeared in a leaflet about sanctions. In one example, titled “Sarah’s story”, a jobseeker is quoted as being “really pleased” that a cut to her benefits supposedly encouraged her to re-draft her CV. “It’s going to help me when I’m ready to go back to work,” the fabricated quote reads. Another, by a benefit claimant supposedly called “Zac”, details the sanctions system working well. “The photos used are stock photos and along with the names do not belong to real claimants … The stories are for illustrative purposes only,” the department said. In March this year Parliament’s Work and Pensions Select Committee said there was evidence that sanctions were geared towards punishing people for being unemployed and might not actually help them find work.